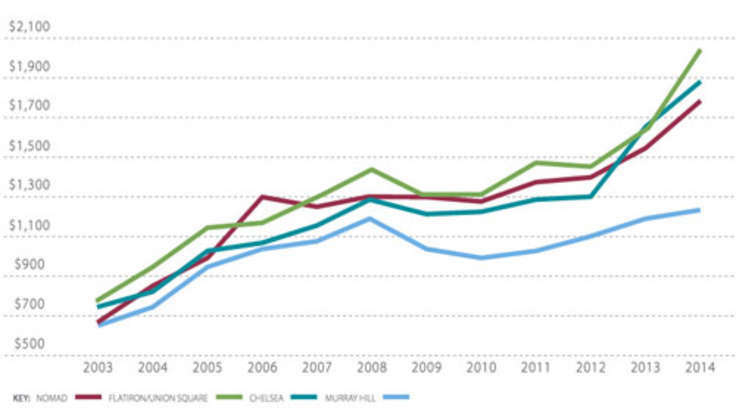 HFZ Capital Group's “The Eleventh” at 76 11th Avenue, will be West Chelsea’s largest development in decades. 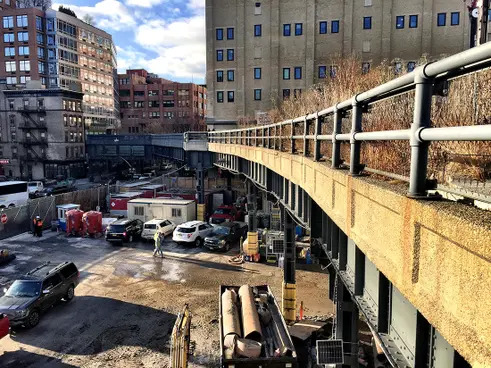 Its former parking lot site encompasses a full block between West 17th and 18th Streets, which in several years will hold a 950,000-square-foot complex containing parking, retail and office space, a 137-room Six Senses Hotels Resorts Spa and 240 condominium residences. Straddling the High Line and offering sunset views of the Hudson River, the very-visible site demanded an architectural icon be created. 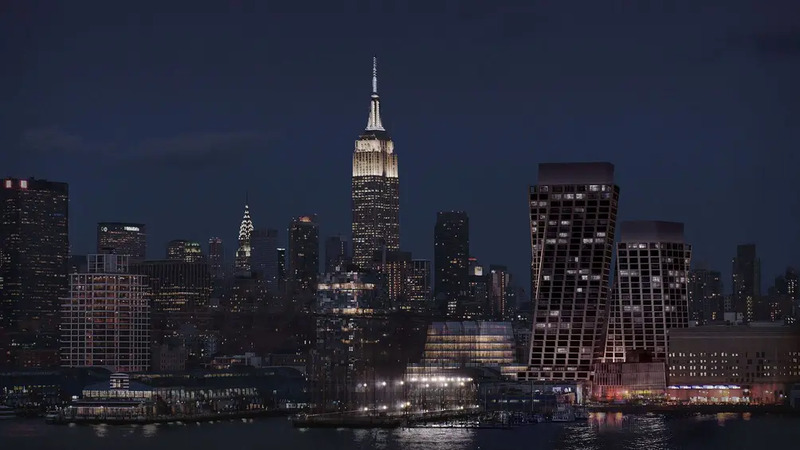 Ziel Feldman, HFZ’s chairman and founder, enlisted the talents of Bjarke Ingel’s firm, BIG, to design their second Hudson River-hugging tower in the city (Via 57 WEST being their first). Here, the celebrated Danish architect molds two energetic towers atop a four-floor base. The eastern building will rise 28 floors and the west, 38. 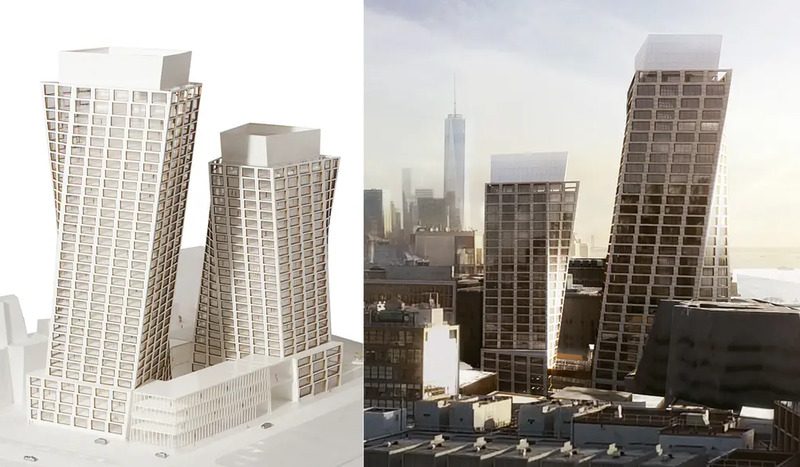 With maximizing views being of utmost importance, bulk is moved from the lower to upper levels, and corners are cut away to create a torquing effect not seen in Manhattan since the franken-freedom tower created by the forced marriage of Daniel Libeskind and David Childs. BIG recently published on their website some new views and their signature concept development slideshow that walks us through the design evolution. 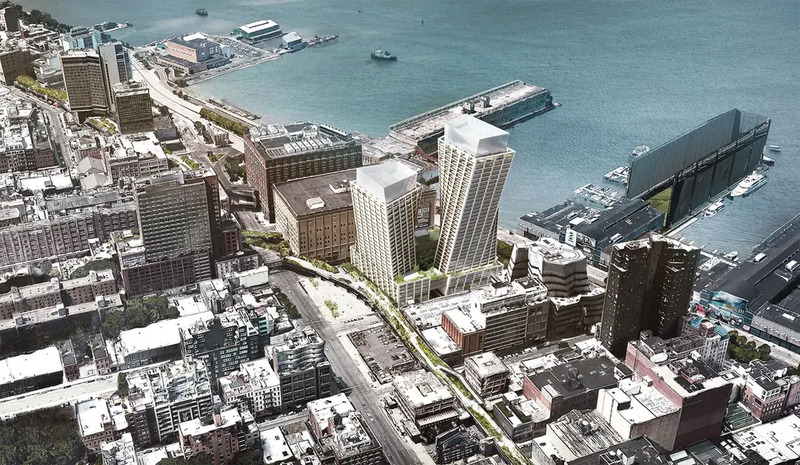 According to the firm, the challenge was to fully take advantage of the skyline and waterfront views while avoiding direct views from one building into the other. 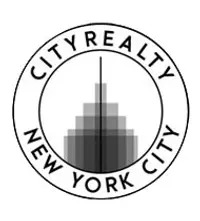 City zoning regulations limited the height of the river-facing tower to 390 feet and the High Line-facing building to 290 feet. A 60 to 85 foot-high streetwall for the site was also stipulated. 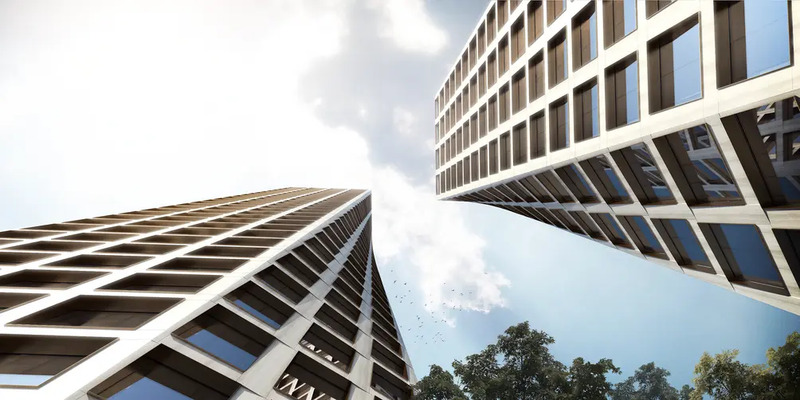 The conceptual design process began by running a diagonal slice through the two towers that would allow units in both to have views past each other, to the east and west. 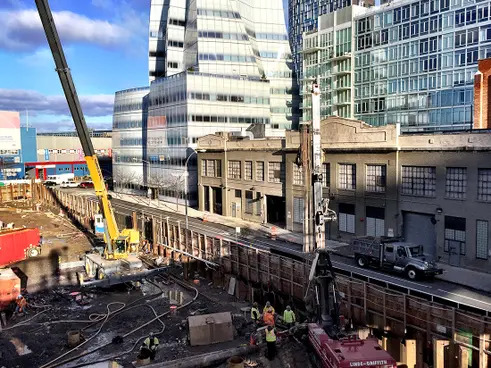 The 131-foot tall Merchants Refrigerating Company building sits directly south of the site, thus the base of both new towers will be setback and the removed bulk will be relocated to the more valuable upper floors. 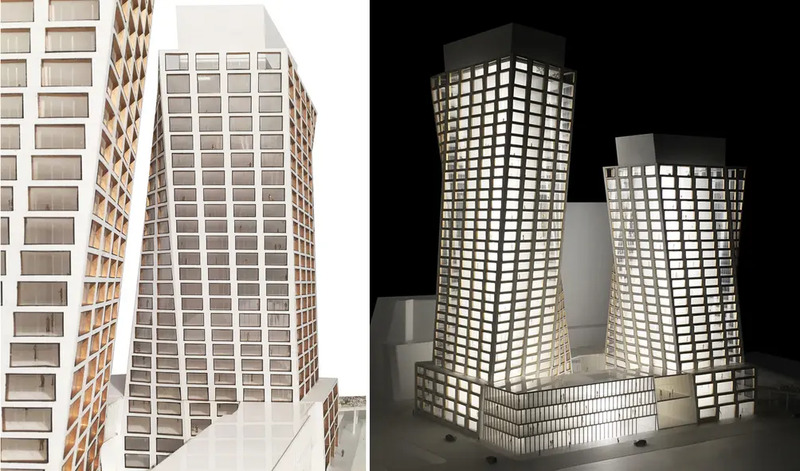 A similar process is done along the north side in response to Related Companies’ upcoming 22-story apartment building planned at 501 West 18th Street. A through-block passageway and motor court divides the parcel at the prodium and independent bridge elements connect the upper levels of it. Many of the residential amenities will be here along with much of the office space and some of hotel's lavish amenities, including spas, two restaurants and a private members club. Two corners of the building are carved away with a warping surface to create additional privacy between the units and facilitating a more dynamic form. 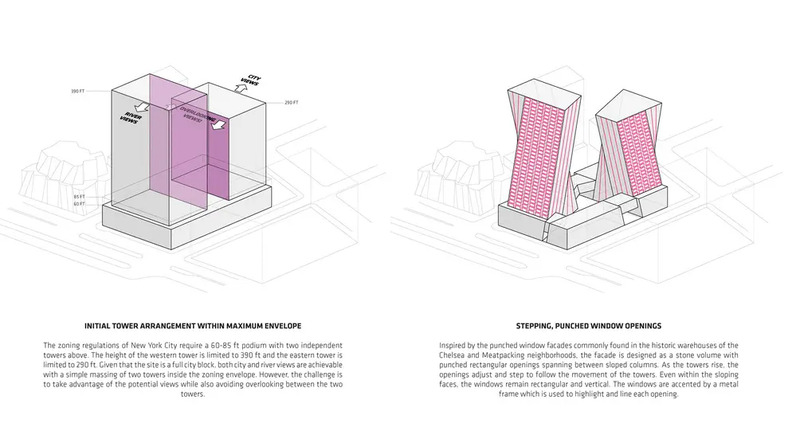 BIG says the “punched-window” façade is inspired by the daylight factories found throughout the area, which in some degree motivated the pioneers of modern architecture. Despite the sloping faces, the windows will remain rectangular and will be accented by metal frames that provide some golden glint - similar to Foster’s 551 West 21st Street. 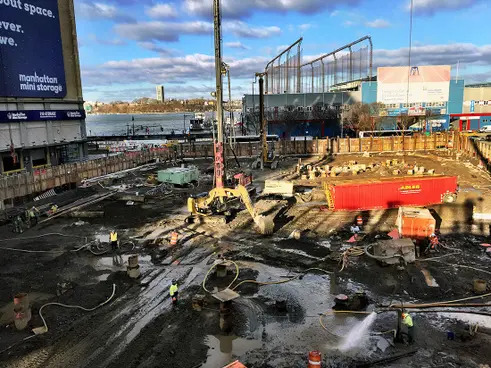 Construction at the land-filled site began last summer and the laborious (and unexciting) site preparation work of caisson driving and de-watering continues presently (as seen in our photos from earlier today). 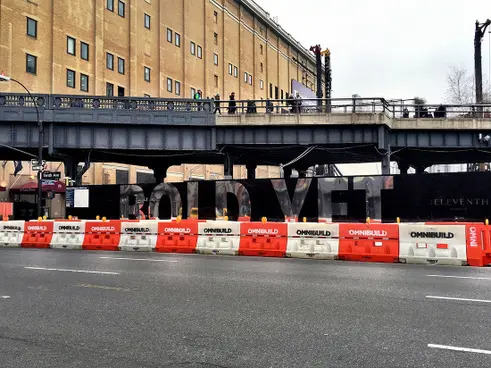 Emblazoning the site’s perimeter fence is some glossy new signage hailing the project’s design attributes with statements like “Bold yet Graceful.” Also noted on the fence is the reveal of the project’s official website, theeleventh.com. Prices for the condos are reported to start just below $4 million and completion is expected in 2019.